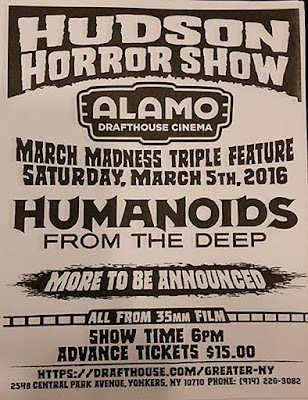 THE B-MOVIE NEWS VAULT: Hudson Horror Show MARCH MADNESS TRIPLE FEATURE tickets on sale now! Hudson Horror Show MARCH MADNESS TRIPLE FEATURE tickets on sale now! UPDATE: HUDSON HORROR SHOW'S MARCH MADNESS TRIPLE FEATURE HAS SOLD OUT (IN RECORD TIME)! Sorry if you missed this one gang! But don't feel bad, there's plenty of awesome coming up in Hudson Horror Show on May 14th, 2016!!!! HUDSON HORROR SHOW is a 35mm-fueled juggernaut that cannot be stopped! The event has grown so large that it occupies TWO screens during it's bi-annual film fest! On Saturday, March 5th, the Hudson Horror crew is once again conquering The Alamo Drafthouse in Yonkers, NY, with yet another "March Madness" triple feature that's sure to please fans of Horror and Exploitation cinema! Tickets are on sale now, and half of them are already gone! So do yourself a favor and CLICK HERE to order yours right now. 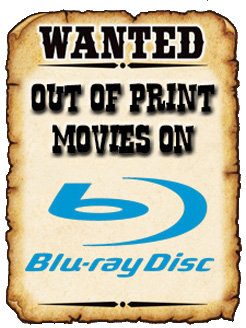 If you wait, they will be gone, and you'll have to sit at home and sulk on March 5th! Highly-evolved icthyoids (i.e. "fish men") rise from the deep and attack a small fishing village. All men must die, and all women must be impregnated, in this insane Roger Corman production featuring genre vets Doug McClure and Vic Morrow. Also keep an ear out for the score, which was created by composer James Horner, whom you may recall tragically died in a plane crash last June. Linda Blair stars in this sadly oft-overlooked 80s slasher film, where a group of college students must stay in a "haunted" mansion on Halloween night in order to join a fraternity (and sorority). What is supposed to be a harmless night of fun, quickly turns into a fight for survival when the would-be pledges discover that they are not alone in the house. This is a cool little indie Horror flick from the early 80s that has several memorable moments, and I think the audience is really gonna dig it! Brad Dourif stars as the villainous Charles Lee Ray, who uses a voodoo spell to hop into the body of a Good Guy Doll after being fatally shot by a police officer (FRIGHT NIGHT's Chris Sarandon). The possessed doll ends up in the hands of a young child named Andy, and soon strange "accidents" begin happening. Is Andy responsible, or is his doll "Chucky" really alive? Well honestly everyone knows the answer to that question, but who cares, because this movie is awesome, and gave us one of the most beloved Horror icons from the 80s! So save the date (MARCH 5TH!!!! ), GET YOUR TICKETS, and hopefully I'll see you there!